Yeah, it happened again. This time someone was able to change a newspost by Nighmarjoo (So he either had admin credentials on the site or write-access to the Database) and put a "index.php" file in the webspace, which deleted almost all files. I will restore 99% of the content soon - But I will have to make some changes first. Allowing generic HTML and even JS is foolish, and it is pretty easy to put some php files on the webspace that do whatever the cracker wants. Do ppl still do new maps? A pretty simple way to improve the security without losing any of the great archive of maps we built in the past years would be to make the site "read only" and not allow uploading any new maps. or even prevent any interaction like commenting? What do you think? So, I re-uploaded most of the content. Please tell me if I missed some of it. I disabled "file database". I'm almost positive that's how the hacker got his fatal PHP script on the server. Also, you can now change your password. At least the admins on the site should do so. There seems to be a problem when changing passwords that I don't really understand yet.. Except for that, please test the site and tell me if there are bugs or missing content! Getting back on track with Maps of the Month, I hereafter present November 2009's MOTM! In first place, we have a clear winner, such a godly map that I don't know why we should even keep making MOTMs, as this map will blow away future winners indefinitely, hmm.. more on that idea later. Famous mapper LastCurse gives us: crapshit2.jpg, er I mean (2)DeadSpace 0.98! This cataclysmically great map starts out with a bang: low ground mains with highground nats! Reversing the altitude I'm sure will be standard in all maps from now on. The nats are pretty wide, making fast expo builds potentially riskier vs trashcan players seeking to all-in early on, further deviating from the norms of comfortable, skill-based gameplay we're so used to. Lastcurse intends with this feature to blow our minds away by forcing new standards in gameplay, an action surely needed with the release of Starcraft 2 Beta, initiating the demise of Broodwar as we know it. "Cliffing" the nat from beneath it lies an islandy pit which doubles as a useless ovy spot to trap noob zergs who think they can scout their opponent, hah! Just outside the nat we have a path leading to three roads, a LastCurse choke, if you will. The outward path leads to the 3rd gas expansion, a relatively safe base fairly close to the player, and pretty far from your opponent. As the path with the LastCurse choke is higher altitude than this path, it's easier than otherwise to control and secure the expansion, ensuring its defensiveness. There is no safer possible expansion to choose from as your 3rd base. As such we have a more linear expo layout, but let me assure you this is simply another grand feature by our genius LastCurse. Nonsensical features like nontraditional expo layouts, where players have "choice" in where and when to expo simply distract from the game itself. Rather than invoke strategic diversity, making each game truly unique and spectacular as previously thought, the concept simply confuses bad players, reducing the amount of gamers who can enjoy a map employing the idea, how silly! Thanks LastCurse for not using that quaint concept, and enlightening us about its adverse effects on a map's overall gameplay. The central path from the nat's LastCurse path leads to our 4th gas expansion, well sort of. Instead of a boring antiquated ole' normal expansion, our 4th is a reverse-oriented mineral block. That is to say, it blocks off the path with its mineral formation, and to use its gas (as opposed to just its minerals), you must go around it (or hop over it) and expo on the other side of the mineral formation (don't try to transfer your workers to the expansion after doing this!). Players can choose to take this expansion from the "normal" side and mine it as a mineral-only expansion, but their workers will be vulnerable from behind. For a terran in tvp though, this will probably actually be common. Securing this base, particularly with siege tanks, helps defend the 3rd gas expansion, limits your opponent's mobility to a certain degree, all the while getting more minerals. Siege tanks will easily defend the workers, and the terran can safely rally here. When he chooses to move forward or when the lower mineral valued block is mined out (allowing a potential worker transfer) the terran can easily lift his command center to the gas side. The inward path from the LastCurse path leads into the center, and into a two-forked path. Counter-intuitively enough, the outward path of this fork leads into the most-center path, while the inward path leads to the outer-central path. The former has another two-forked choke, the inward path thankfully leading to the inner-most central path of the map, the outer path leading into the linear path along the edge of the map leading to the 3rd gas expansion. The gas-side of the 4th gas expansion has a large ramp outside of it leading into this path as well. Going backwards along this path takes you to the 5th gas expansion. It's here we actually have a degree of expo-choice: the expansion is far from everything! It's close by air to one player, and lies along the 3rd gas path of the other, but then lies along the inward-outward path of the first player. It has a fairly large choke, a ramp higher than the ground leading to it. The expansion thus is fairly defensible but not incredibly so. An actual cliff overseeing it can harass it easily, and I'm sure tanks from inside the main by it can hit parts of it. I'm not exactly sure how or when this expansion will be used, congratulations LastCurse, you confused me! And that's the map in a nutshell, so let's look at it in overview. The map is 128x112, making it taller than many (2)maps, but not as big as the vacuous 128x128. The end result is a very long distance from everything to the 5th gas expansion, but also a wider middle. Aside from the very corners of the map there's basically no wasted space, and the first 4bases are all pretty near eachother, making the distances generally respectable. Personally, I'd have stuck to 128x96. A different middle involving fewer chokes (which use up/reduce space in the middle) especially in conjunction with different shapes for the main and 5th gas expansion to use space a little more efficiently would result in atleast just as open a middle, but with better distances and a higher degree of efficiency as far as space allocation goes. However the map is probably fine as is. Aesthetically the map is less than perfect. LastCurse opted to use terrains lacking differential decorational terrain-types; there is no low altitude terrain that fits with the lowplatform he used, and while there is high plating, he covered the highground with unbuildable tiles making use of plating impossible. He used such tiles along all of the lowground and normal platform away from expansions as well. Some of those ramps are not great looking as well. Seems like a tileset limitation. The map probably centers around a fairly turtlish macro play-style. The expansions are close together aside from the 5th, which is hard to take outside of as a hidden expansion, ie hard to take securely. It's hard to be aggressive at all given long nat2nat distances and the close proximity of the first four bases. The middle is fairly linear and tight, although its many paths can be used to a degree of openness and nonlinearity, Bluestormesque. Balance-wise my prediction is that it'll be t>z, p>z, t>p, the classic turtle/tight map imbalances. Terrans will probably mech vs zerg, and play passively vs protoss. Anticipate carriers with the many cliffs. The main/nat layout/shape strikes me as being relatively mutalisk friendly, and the long distances certainly dissuade any lurker oriented builds. Maybe you'd see a lot of crazyzerg. zvp should be pretty standard, I'm just betting on the safe 3/4base of p to beat out zerg in a long macro game. Maybe anticipate Shine-esque lair-based play to abuse the long distances and large mains. Second place won second place last post, just read it again if you want. Third place takes after its image name very well, feel free to check that out on your own. Now in lieu of reduced activity at broodwarmaps, Map of the Month has become quaint and antiquated, so we'll be replacing this archaic institution with a more modern and more competetive competition: The LastCurse Map and sty_lezerg-ex/tktkvroom Second Place Map of the Fortnight competition, aka the LCSZ&TKMOTFN! Every two weeks we'll be showing off the greatest works of LastCurse, who is changing his ID to LastBlessing, and the dynamic duo sty_lezerg-ex and tktkvroom, who are merging as an archon and taking on the name StyleVroom! Every fortnight you guys will vote on which of their great maps are the best and second best respectively. Nightmarjoo: Hey LastBlessing, can you tell us what you do when you're not making amazing maps for our site, keeping the greatest international broodwar mapping site alive almost singlehandedly? Nightmarjoo: Haha, how amusing. So how do you make the amazing maps you do? I almost have to compare your maps to Testbug's now! Nightmarjoo: Wow, no wonder they seem so great, they're partly influenced by me! I'll have to be more openminded from now on, and accept the myriad of unique ideas, even if they don't conform to what I've decided and told the universe is correct! Nightmarjoo: You're right, I'm just kidding. Nightmarjoo: So what will you do now? What's the first LCSZ&TKMOTFN winner gonna be? Nightmarjoo: Wow, you're such a bold mapper! Just what the community needs. So, may I ask what prompted your name change? Nightmarjoo: Yes I agree, and I feel your new name more correctly reflects your activities here at bwm too, forcing us to open our minds to new and unique map concepts, helping ensure the security of the site by abusing the site's vulnerabilities as best you can, making sure we fix up those holes lest someone actually malicious try to exploit them, making large sets of new ramps for all mappers to use in their maps, however ugly they are, and guaranteeing the survival of this great site. I eagerly await to see your next maps. Nightmarjoo: My last question, do you have any helpful tips or suggestions for lesser mappers, such as Protoss4ever? Or what about our other rising star, styleVROOM? Nightmarjoo: Haha, you're so great and helpful, what an impressive guy! Most guys of your status and skill might be obnoxious or conceited, it's nice seeing such a modest, down-to-earth mapper. Thanks again for the interview and your continued support of the site! Soon we'll be caught up with the old MOTMs, just in time for the first LCSZ&TKMOTFN! This two player map is relatively standard, so I'll start with the most unstandard feature. Behind your otherwise normal nat in front of a normal main lies a backdoor closed by a mineral block (I don't know the mineral values). The theme of the map begins here. From your nat you have two paths, one leading over a nastyridge into the center of the map. The center is unremarkable, linear but fairly open. There are no expansions or strategic features in the middle. Following the backdoor path leads you to a fork, with an enlarged ramp leading to the 3rd gas expansion plateau, the other leading along the edge of the map, around the plateau. This path and a default-sized ramp from the plateau lead to a mineral-only expansion. Continuing along this path takes you to a second plateau with the 4th gas expansion. There are large ramps leading into the center from both plateaus. As far as the map itself goes, that's it. Strategically the key to this map is controlling the plateaus. The middle itself has absolutely no value to it at all, a lot of the action is going to revolve around the plateaus and the side paths. The center links the two sides to eachother, and of course represents the main pathing from player to player. The other gameplay feature here lies in some relative flexibility as far as expansions go. Players do not necessarily need to take any expansion in any order. A player taking what I labeled the 3rd gas expo covers the backdoor to his nat, and puts himself in a pretty safe defensive position. From here the player is probably going to attack down the middle, particularly if his opponent also took the 3rd gas expansion. If his opponent took the 4th as his 3rd, the player could push along the side path from his 3rd, taking the min only as he goes. If his opponent took his 3rd gas, the player could push along the side anyway into his opponent's 4th. A player could take the 4th as his 4th, perhaps taking the min only by his own 3rd to defend his 3rd/backdoor from that side. The player could opt instead to wall-off his backdoor and take the 4th as his 3rd, and pressure his opponent along that side. Expoing on this map leaves you fairly vulnerable, which partially is responsible for the flexibility in expoing. There simply is no expansion you naturally take in any order, aside from the natural itself, hence its name. In second place was (4)Orchidees Noi by Freakling. Just look at my post about the map when it won 2nd place for July's motm here. And I don't reward 3rd place out of 4 maps, which if you're curious was sty_lezerg-ex's (6)Twin Headed Snake, with 10 points. For September of 2009, our winner is Tk's third appearance in a row, co-authoring with sty_lezerg-ex to make (4)Broken Wings. This rotationally symmetrical four player map throws the mains in almost the corners of the map. The main itself, aside from being perhaps a little tight/small is standard. The nat deviates from the norm with another backdoor path. This backdoor is more prominent than last month's map. It leads into a cliff that oversees and circumvents the main, leading to a neutral blocking off the ramp to the 3rd gas expansion. The third gas expansion has a nastyridge on its other side leading into the center. The 3rd gas expansion by your own main is not necessarily the expansion you will actually take yourself, and in fact I find that to be unlikely. The 3rd gas expansion near your nat, but by another player's main is probably a safer pick. If your opponent is there, taking that expansion as your 3rd allows you to pressure your opponent. Securing the backdoor is critical for protecting both your nat and your main. In the wasteland of a middle lies a 6-block mineral-only expansion. I don't know when a player would ever take it, probably never unless the game lasts a very long time. This expansion is fairly far from your other bases, doesn't lead into any other expansion and thus has very little if any strategic worth, it has virtually no economic worth, every other expansion both has more minerals and gas. The base is very vulnerable, being in the middle of the map with no choke to defend. I imagine the only reason it's there at all is so you can pretend the middle has something in it. It still in my eyes, does not. A big mass of clutter in the very center linearizes the map needlessly. Gameplay should be pretty basic once you decide which gas expansion to take as your 3rd (your 3rd, another base's 3rd, or another base's main/nat, all of those being viable and/or preferable in some scenario or another). In second place we have p4ver's tileset change/bugfix for the former promap (3)Demon's Forest, now titled (3)Demons Shiver. Promaps don't win bwm competitions, nor do tileset changes. In third place we have Excalibur and sWaGu's (4)World Tree, but my understanding is that it is incomplete, and whether it is or isn't, I see no reason to reward a map that lost to a tile-set change. 2009's October is graced again by the dynamic duo that is Tk and sty_lezerg-ex (what a lame name, let's vote on new names for him! ), finishing off tk's 4-win motm streak. Apparently these guys became bored with all the standard maps we've had in MOTM lately, and made this map: (2)Flash. The bizarrities begin right off the bat, with two entrances to the main. One is blocked with a stack of 6 neutrals (700 hp each neutral, so 700 splash damage kills the whole stack). Down the middle of the map is a wall which cuts the map into two sections, and the rest of the map is based on this division. In the center of this division is a troygate, which of course can be closed off. Once you close it, there are two neutral-blocked chokes which connect the two areas. And of course, the two areas are connected through your main. On the nat side of the map is a gas expansion on a tiny hill (so tiny that 3 cannot make comsat, and I will never edit this out, shame on you stylezerg/tk! ), and past that is a large plateau with another gas expansion. This plateau leads through a backdoor into another gas expansion which lies behind your opponent's main. This expansion is pretty out-of-the-way except for by air/drops, but is easy to defend. Being hard to attack, hard to reinforce, and out of the way, this expansion is likely to play as a semi-island in many situations. A second choke, a bluestorm choke (lets only small units through) leads from that expo into a path which leads along-side the plateau ramp into the middle. Right outside this path is yet another gas expo, this being what you could call the "2nd nat" for your opponent. This expansion is right outside your opponent's 2nd main entrance. Then, in the very middle, on either side of the troy-gate are mineral only expansions you'll never take. These things are actually worse than the ones in Broken Wings, if you can believe that. Think about the expansions I said no one in their right mind would ever take outside of desperation in a very long game, make them shootable from behind, and take away a mineral. They atleast are fairly near other expansions unlike the broken wing min onlys, but there are gas expos with more minerals that are safer to take at the same distance or closer to another gas expo everywhere on the map. I don't understand why these min onlys are in what is already a money-rich map. At anyrate, if you hadn't figured it out already, this map has very complex gameplay. There is a constant dynamic between the two sides. Players can always find a gas expo near another gas expo they already own on either side of the map, so there's a lot of flexibility in where and when players expo. Every expansion has an alternative choice that's just as viable or more viable in any given scenario. Mostly, the gameplay will be determined by how the players choose to use the neutrals. Aggressive players will seek to open up the neutrals quickly, allowing them to pour units all over the map, attacking their opponents on both sides of the division. Defensive, more passive players will seek to protect the walls (terrans can repair all the neutrals aside from the troygate, an interesting mechanic). This map is fairly experimental, and as such is a little messy. The gameplay should be both interesting and fairly solid. It should be fairly difficult to play passively vs an aggressive player, so it could be difficult for players more used to passive play as such. I think the rewards to being aggressive too far outweigh the rewards for being passive, so I can't see it playing out any other way. The messiness is somewhat due to the experimental features, but more due to the odd expo layout. The concept itself would probably benefit a lot from a remake with a different expo layout. The authors apparently did not find it necessary to look into this however, and I decided to make fun of LML instead of giving them an essay on how to improve the map, so this is what we're left with. Either way, this map is interesting, relatively well-made, and is worth playing a few times if only to see how the divided-sections concept plays out. In a very close second place is JungleTerrain's (4)Desert Yellow (4)Naous. This map is very standard. There isn't much to discuss here: You have a normal main and a normal nat. You have a normal/open/cluttered middle with mineral only expansions nearest to the nats. Cliffing the mineral onlys is a plateau which leads into the 3rd gas expansion, next to the mains. 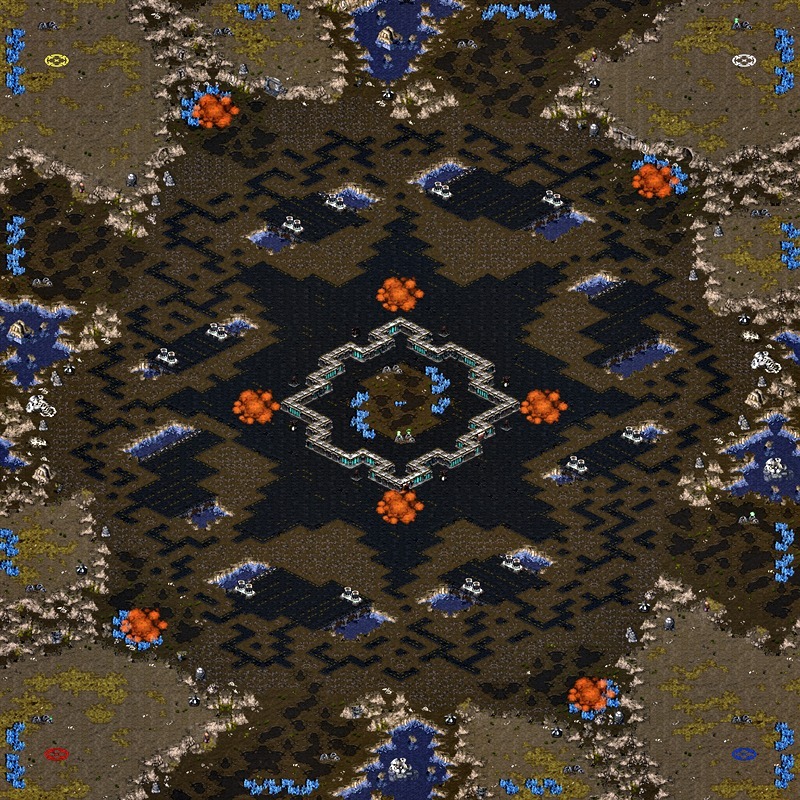 Zergs will likely take a nat/main as their 3rd (possibly a far 3rd gas expo vs terran, attempting to defend the small ramp with lurkers), and terran and protoss will probably pick a plateau based on where their opponent is, and take the mineral only/gas expo there, in no particular order. Players with map control will probably take the gas expo before the min only. Depending on positions it's probably a good idea to push towards the plateau facing you, and defending the gas expo from the plateau itself, inching into the min only a little later. If that's not possible players will probably take the min only nearest to them, then use that expansion to secure the plateau and the gas expo a little later. And, that's it for the map. As I said earlier, I don't reward 3rd place out of 4th, which is sWaGu's (3)Hope if you're curious. And there we'll stop for now, as I don't know if bwm is ready for a lastcurse motm quite yet. There are three outstanding MOTMs remaining, and then the current MOTM. If you haven't taken the opportunity to vote for 2010's January/February combined motm, please do so now! That motm has quite a few great maps, it would be a shame to spoil what ought to be such a tough competition with too small a number of votes. Be sure to look for great maps to submit for this current MOTM, as there's hope it might be posted this year! I dread the boredom of new year's eve for a nerd with no social life like me (I'm exagerating a bit here, but still), so I need something to do while everyone else is getting hammered. By the way, I just got rid of a lot of domains I did not use for a long time. I also cancelled mapcraft.net, because I realised I would not have the determination and motivation to make it work anyway. I will make a backup of the code and the database. I'm sorry for the time some of you "wasted" in a project that never got finished. I know it's early, but I've decided to post MOTM 6 and 7 anyway! For June, Freakling takes his fourth MOTM in a row! Will his winning streak ever end? 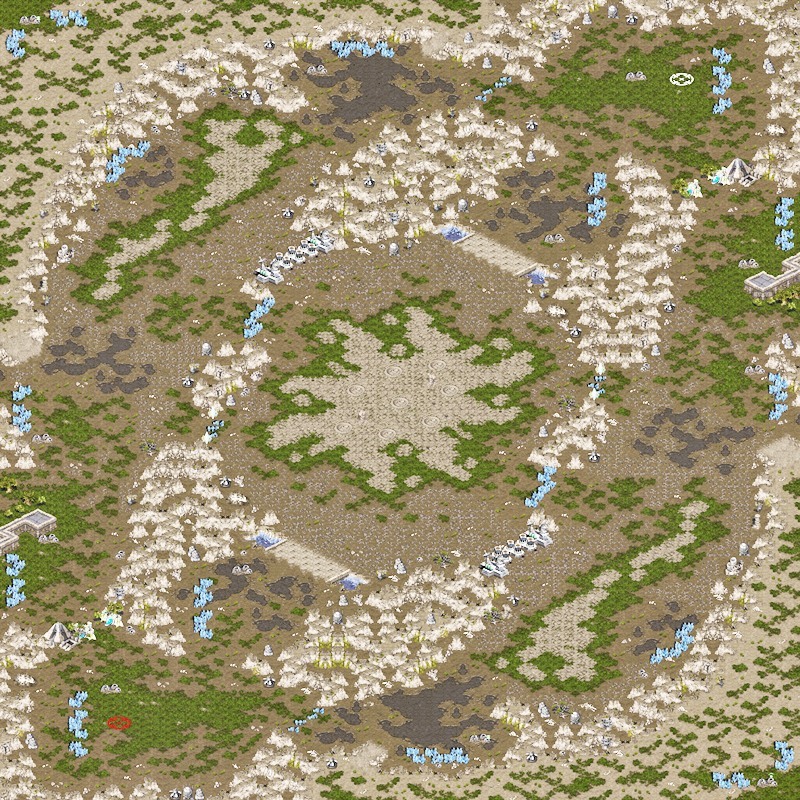 In typical Freakling fashion, we've got a 4 player map with rotational symmetry and some weird twisted ramps in the center, with a sprinkling of dwebs and swarms here and there to add some strategic value to what would otherwise be normal, boring terrain. (4)Schizophrenia is this map's name, and those weird center ramps sure make me and that guy no one else can hear feel schizophrenic. Big ramps seem to be this map's theme, every "choke" on the map is formed by a large ramp. The main choke is tightened with a neutral and mineral block to make 1base builds as inviable as normal (as opposed to being worse than normal). The nat defends an in-base of sorts mineral only expansion which is overseen by a dweb'd off cliff (good luck getting to the cliff though, it's tucked away pretty well). Aside from the position of the min only, the expo layout is pretty standard, with gas expos on plateaus of sorts in the middle. So all of this is pretty good, and the map is aesthetically really good, so why all this delay on posting it as MOTM? Well, the problem lies in the nat. The natural is very open and has a very tight choke, a lethal combination of traits. An open nat with a tight choke (python, destination), or a tight nat with an open choke (zodiac? medusa? longinus?) are the better choices. The natural is so open that it's basically impossible to fast expo as protoss vs zerg safely (have to rely on zerg not abusing this, which isn't likely if zerg is trying to win). Terran will have a hard time defending his natural because mines and tanks won't be as effective as normal vs aggressive dragoons, and has no cliff (usually the main) to place tanks on to give protoss a harder time doing damage. Zerg may have trouble preventing runbys by vultures or marines and medics (and bats, oh my!). However, if you can get by that snag somehow, the map will assuredly play very well and yield exciting games, especially centering on those spells. In a not-really-all-that-close-but-not-all-that-far-off second place, we have a face new to MOTMs, sTY_leZerG-eX, whose name is coincidentally the hardest I have ever had to type in a motm post before, including p4ver's map names. Our second place map is (2)Kings of the Hall! This map sure is weird, resembling Monty Hall with its trilinearity. The map uses a variety of modernly used "tricks", such as the Troy gate, a min wall block, and a neutral block. The map differs most from Monty Hall in that the three battlegrounds are indirectly or directly connected to eachother, albeit blocked by some block or another. This map is sure to provide entertaining (and long) games, with its variety and multitude of expansions (some are cliffed, some have gas, some are far from ramps making them semi-island of sorts). Games on this map are likely to play in phases, with players focusing on one particular aspect of the map, be it locationally (perhaps a single battlefield) or some kind of play (perhaps drop-based or land-based), in a similar manner to how (2)Hitchhiker played. I however can't see it playing "normally" at all, with how safe the expansions are initially. The map should for the most-part play well, and for the most-part looks good, so be sure to check it out. And STy_leZerG-eX has not deemed our website worthy of an observer version, you'll have to bug him about that. And third place, by a single point, with an insignificant amount of points (7), is (3)3 by Nightmarjoo. 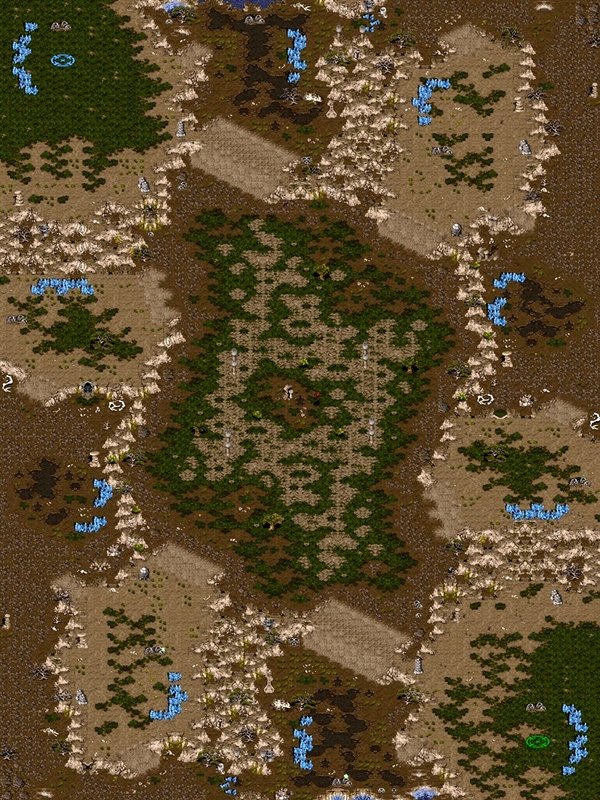 Not much to be said about this map, it's a blood-bath-esque micro-oriented map featuring a center cliff players can open up by mining out stacked blocks of 0-value minerals to either open up new paths or to provide a method in which to support and cover their units. The map has fewer minerals per player than blood bath, with an 8-block main and 1 4-block expo, as opposed to an 8-block main and 2 3-block expos, however for main + 1 in-base expo you get more minerals, and you get a geyser as well. The extra gas should help the games be more tech-based and thus longer than traditional blood-bath games. A 1v1 on the map is probably centered around securing the third main. For July, our first place map is (2)Cloud of Souls by TKTKVROOM and Nightmarjoo. 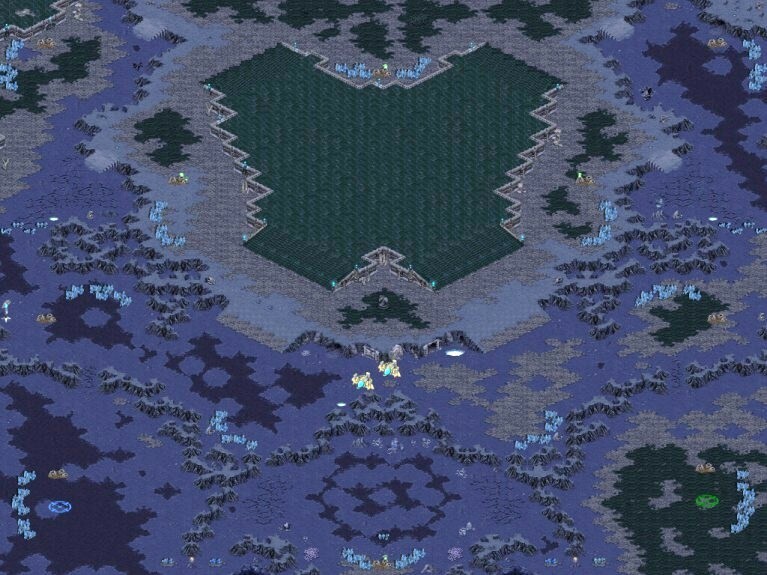 This map shares the symmetry of and has many similarities in layout to RoV and BlitzX. This map focuses on an evolving layout, as the map progresses different paths are opened and closed. In the corner of the mains is a "Cloud gate", a construct of a hallucinated mineral block along with a normal Plasma egg/mineral concept. Players can use this faster and harder to block route of scouting if they can get their scout worker to the gate before the mineral disappears (which occurs slightly before most players normally scout), or if they get vision of one of the minerals in the semi-island expansion in the center of this route. This gate can be further abused by running your scout worker to the inside of the gates (out of your opponent's main) by using one of your main minerals (which you should have vision of), allowing a dying scout to escape pursuit, and to reenter the main when pursuit leaves provided the opponent does not remove the small stack of 0-value minerals (though vision of a main or nat mineral block will suffice), enabling players more ways to scout eachother throughout the game. This path can be used to attack the opponent's main while bypassing their nat as well if the eggs are destroyed. Proxy robotics facilities, proxy factories-lifted, a proxy gate with dts (who destroy eggs quickly) etc could all be placed in the intermediate area as well, giving players more ways to harass and cheese eachother (oh joy!). Behind the naturals is a stacked 0-value mineral blocked path that leads to a corner gas expo (and can be exploited to harass/scout your opponent as well). In the center of the map, on the path that leads between the players is a troy-gate. Closing this gates permamently closes this path, making the mineral only expansions safer, decreasing the linearity of pathing slightly, and slightly increasing the distances between the players. Closing the gate shifts the gameplay to the upward half of the map, though not entirely as the bottom-most path still exists and could be opened up during this time as well. From here the map is pretty standard, with a multitude of expansions to take depending on what you think you can defend, with all expansions besides the natural being cliffable in some way or another. Strategically diverse and innovative whilst not hurting standard play, this map is certainly worth checking out. Alas, Freakling's winning streak has been put to a stay, but he's not far behind victory, taking second place with a mere 4 points between it and Cloud of Souls. In second place we have Freakling's (2)Orchsomething. Look out p4ver, we've got another map-maker making good but unintelligibly named maps! The map of course is rotationally symmetrical, with weird twisty ramps in the center. The map features a standard expansion layout, with the choice to players as to which gas expansion to take first. They have the slightly closer to-their-nat-but-cliffable center gas expo which players could conceivably rally to, or the farther but perhaps safer gas expo more off to the sides and edges of the map. There actually isn't much else to the map. The map focuses more on executing really well a simple layout than on experimenting with complex and potentially confusing concepts and features. The map's significant aspects are in its extreme mobility, with a variety of paths for players to take, and in its harass-potential, with cliffable nats and central expansions; the other gas expansions being ripe for drops. In typical Freakling fashion, the map is interesting, good looking, and largely standard, and thus is definitely work checking out. 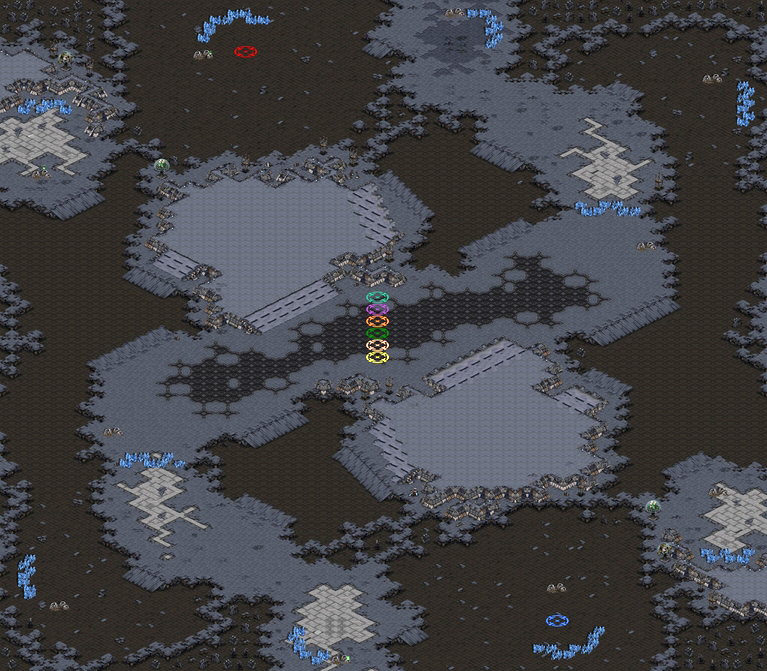 In third place we have STy_leZerG-eX again, with the weirdest map ever: (4)Gleisomething. The mains have two ramps, an 815 ramp and a normal sized neutral blocked ramp, optimized by placement for most possible pathing issues. The nat is pretty spacious with a too-large choke, combined with the 815 ramp encourages 1base play. The third expansions are optimized for not being used by being both mineral only and having a dark swarm over them. Atleast your workers are safe from hydralisks, workers, dragoons, all air units, and all terran units besides firebats. The 3rd gas expansions are semi-island with 815 ramps. In the center of the map is an island expansion with two geysers and 12 mineral blocks, quite the prize for whoever secures it. And lastly, around the center are some inconsequential neutral swarms. Someone tell sty that his obs map link is to the map picture. Coming soon, Map of the Month for August, September, and October (and maybe November)!